Since graduating from Slade School of Fine Art in 2016, Faye Wei Wei has had a whirlwind of a year – group shows, a New York residency at HOY HOY, and expeditions in Japan. 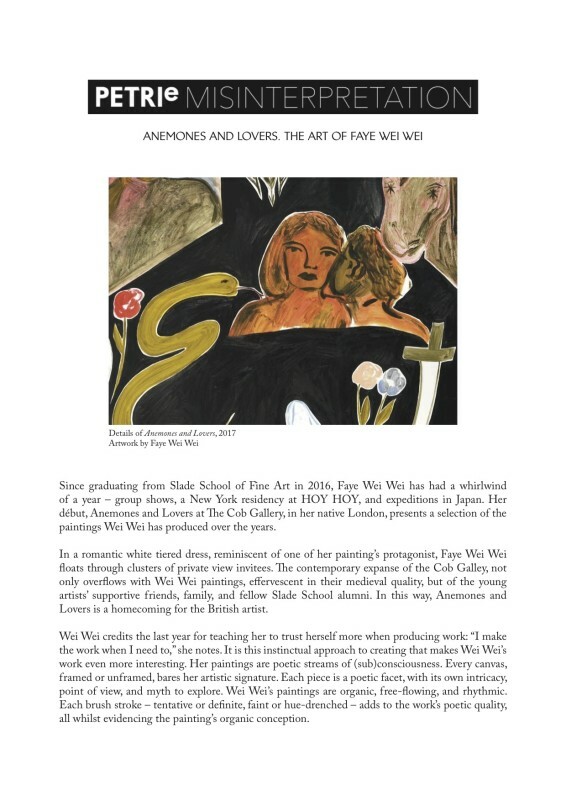 Her début, Anemones and Lovers at The Cob Gallery, in her native London, presents a selection of the paintings Wei Wei has produced over the years. In a romantic white tiered dress, reminiscent of one of her painting’s protagonist, Faye Wei Wei floats through clusters of private view invitees. The contemporary expanse of the Cob Galley, not only overflows with Wei Wei paintings, effervescent in their medieval quality, but of the young artists’ supportive friends, family, and fellow Slade School alumni. In this way, Anemones and Lovers is a homecoming for the British artist.